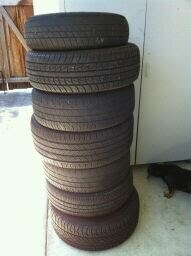 Huge, huge thanks to our friends at Valero for donating some spare tires to us. This is just a little preview of some other VERY cool things to come. YES...we will be flipping tires with the kids. YES, it will be safe and well supervised. YES, it will be awesome. Exercise demo videos for technique will come soon!